TOO HONEST. Liam Neeson apologized during an appearance on 'Good Morning America' for recent racially charged comments. The 66-year-old star of Schindler’s List triggered an international backlash by sharing his story in an interview with British newspaper The Independent this week. In damage limitation mode on ABC’s Good Morning America, the Northern Irish actor expanded on the incident, which he said left him shocked at himself. 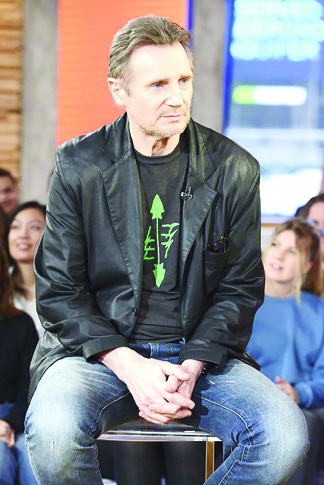 While he says no violence ultimately occurred, Neeson said he sought help from a Catholic priest, spoke to friends, and walked for hours to rid himself of the episode. But he also insisted race was not the driving factor behind his actions. Neeson first revealed the incident to The Independent in an interview to promote his new thriller Cold Pursuit, about a father seeking revenge after his son is murdered by a drug gang. Neeson’s acting career has spanned five decades, and included a star turn in the 2008 hit Taken -- about a former CIA agent trying to track down his kidnapped daughter.